An awful lot of elephant poo | Twende pamoja! My oldest and dearest travelling buddy, Ruth, came out from the UK to join me and we set off to cram in as much camping and hiking as one week would allow. 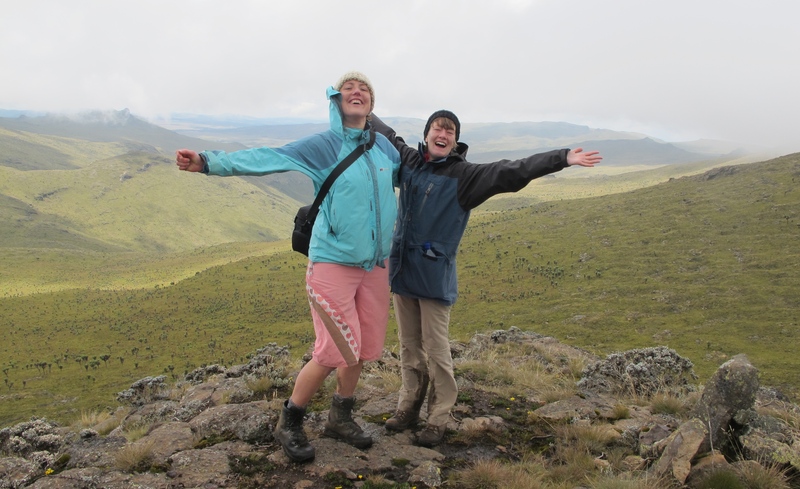 Next up were the Abedares, a hilly range mountain range in central Kenya and home to Kenya’s third highest peak – Le Satima at 4,001m – which was our second coveted triumph. Now, the Abedares is a proper national park. By ‘proper’ I mean there are wild animals strolling about including a tonne of elephants, blooming’ loads of buffalo, some lions and a sizeable handful of rhino. No place for a lone human on foot. Luckily we had Ephraim, Clement, Elijah, Christian and Julius with us! Ephraim (who I know is reading this!) 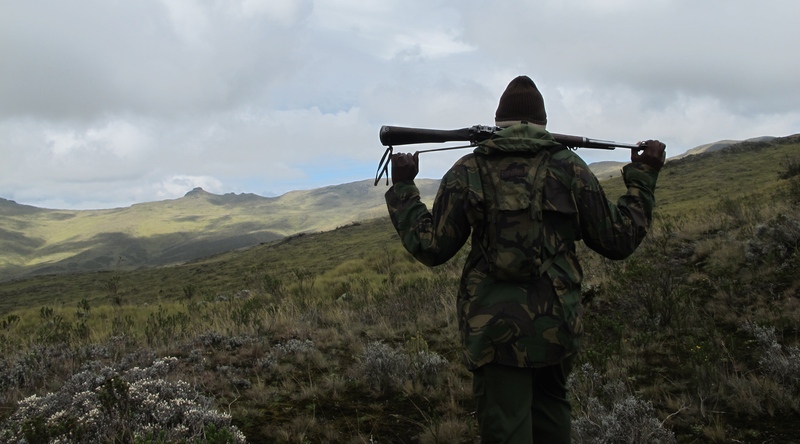 was our excellent guide for Mount Kenya and on this occasion he gathered for us two armed rangers and two cooks to make sure Ruth and I barely had to lift a finger – just our feet – on this trip. 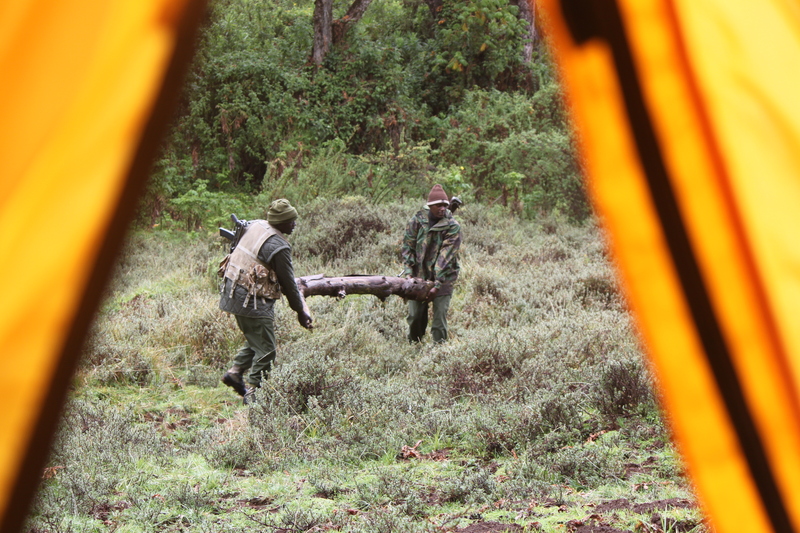 To fight off the cold the rangers set to work building a fire but before long we were tucked up in our tent listening to the screeches of the tree hyraxes, the laughs of the hyenas and straining to work out if any of the other unnameable noises around us were the lions that Ephraim asked us to let him know about if we saw…! An unsettling way to say good night. The next morning was summit day. With 24km ahead of us, Clement led us up towards the peak in his rather excellent camouflage gear. I’m not sure he is really ready in this shot for a lion pouncing out on us…however, his eagle eyes did spot the Mountain Viper that was sneaking it’s way across the path just in front of us. I didn’t think too much of this tiny little snake until I asked whether they were poisonous to which the reply was “oh yes, you would be dead in 15 minutes”. After that taking short cuts through the long grass to avoid deep puddles on the path was less appealing! The landscape was stunning but in some ways more like Scotland than Kenya. And when we got to the Summit, wrapped up in our winter gear, it was hard to believe that we had been sunburned and looking at lions just two days earlier. What was really amazing though was that we didn’t see another person for two days. 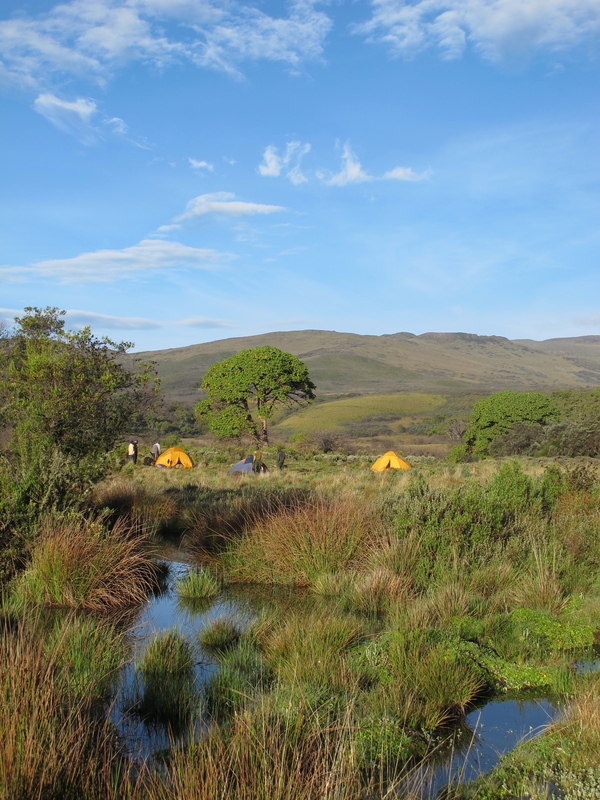 Turns out that, while Mount Kenya has a steady stream of trekkers, the northern Abedares gets maybe one hiking group a month with everyone else making a beeline for the formal campsites further south. People are missing out! Although it was good for us that’s for sure. The next two days the sun came out, the hills decreased and the landscape seemed to change every mile from open moorland, to temperate rainforest, to rolling hills with trout-filled streams and finally to almost tropical tea and coffee filled farmland. The only constant perhaps were the giant piles of elephant poo that paved our way. We kept our eyes peeled and spotted footprints and digging marks galore but failed to see one single elephant the whole time. On the final day I resorted to scattering the dry roasted peanuts I’d brought as energy for the mountain climb around the campsite in the hope they would lure some visitors. Alas, no luck, but it may be that Ruth picked them up and ate them because she is a scaredy cat. This looks like a fantastic trip! Some really beautiful photos! Amazing Catherine! This is all very exciting and I’m sure you are building a nice reserve of great memories while in Kenya. I read somewhere that the cries of Hyraxes is absolutely awful: the worst of the animal kingdom: did you find it so?